Away from the hubbub of the main town area on Gili Trawangan lies a deserted beach that’s home to Lutwala Dive. It is a PADI 5-Star dive centre located at the north end of the island, and just a 20 minute walk from the busier parts of this wonderful scuba diving island in Indonesia. Just a fraction more expensive than diving with other diving centres on Gili T., Lutwala focusses on the very best in quality and service. This includes, but is not limited to, open-heel ‘booty’ fins as part of the rental equipment and PADI instructors leading every fun dive – not Divemaster guides. Lutwala Dive has two boats, and if there is a large enough private group, they will have a boat to themselves. Dive groups are limited to four divers per instructor/guide, and the trips go out three times per day. The boat captains are experienced and have current & valid Indonesian captain’s licences. In fact, all the crew are experienced, having been with the company for several years, ensuring that each trip runs smoothly. 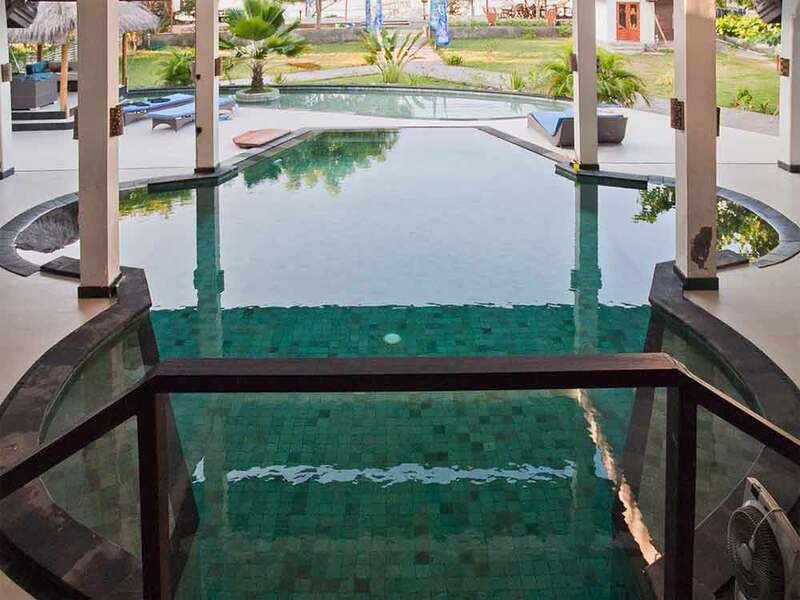 Lutwala Dive is set on a large plot of land at Halik Beach, and the resort has three pools. There is one out the back for bungalow guests to relax in and around, a large and deep pool at the front for learning to dive, and beautiful half-indoor half-outdoor pool with a bridge which is the centerpiece of the resort. In addition to the pools and great diving on offer, Lutwala has 6 private bungalows and an 8-bed dorm. All have air-conditioning and freshwater showers. The dorm room has a refrigerator and two en suite bathrooms and the bungalows are twin bed or double, and have a balcony, private bathroom, security safe-deposit boxes, ceiling fan and exclusive use of the garden swimming pool. 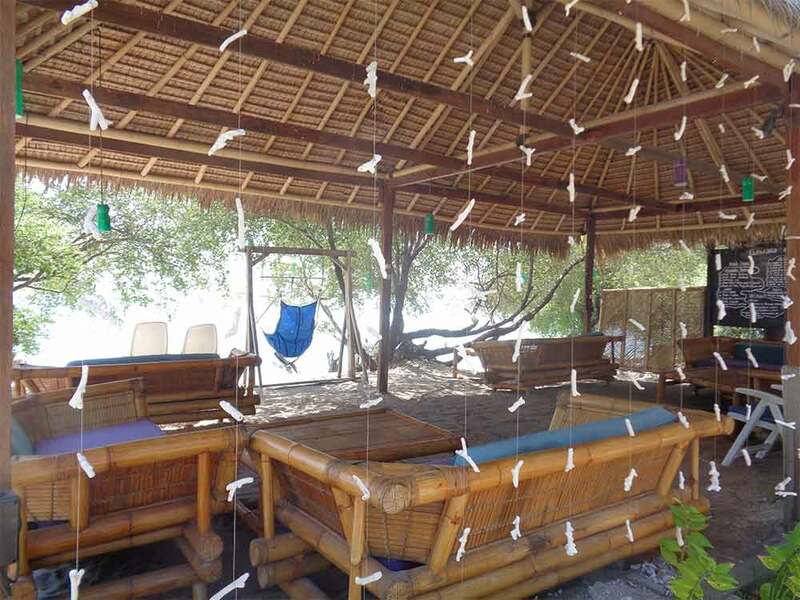 The resort has a beach bar and a café, and there is plenty of space for everyone to relax and/or socialize. There are several different special offers available at Lutwala Dive, including fun diving & accommodation, courses & accommodation, and discounts for groups of four guests or more. Please contact us for more specific details and the latest prices. 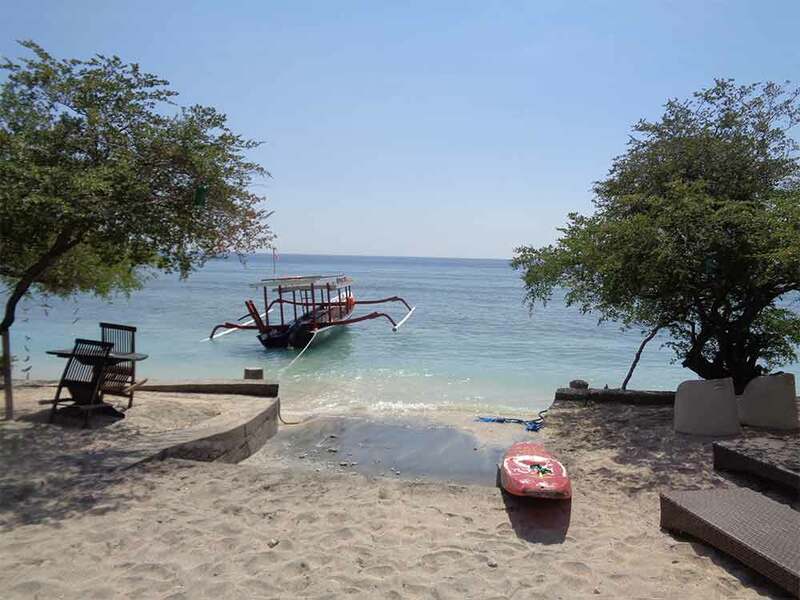 For anyone who wants to enjoy Gili Trawangan for its peace, quiet and natural beauty, without having to deal with the noise of younger party-loving tourists and the village mosque, Lutwala Dive is an excellent choice. The hospitality is the perfect blend of Indonesian friendliness and western efficiency. The location is just far enough away from the centre, but easily near enough to walk to. PADI courses at every level are available in a number of languages. Lutwala Dive has 6 bunglaows, which can have twin or double beds, and even a mattress/cot for a third guest if needed. These bungalows are behind the main building, in a pleasant garden. The bungalow guests have exclusive use of the beautiful swimming pool in the garden. In addition, there is an 8-bed dorm room which has two en suite bathrooms and a refrigerator. The dorm room is simple, but clean and air conditioned. Rates for the bungalows and dorm are very reasonable, and special offers available. Please contact us for details. 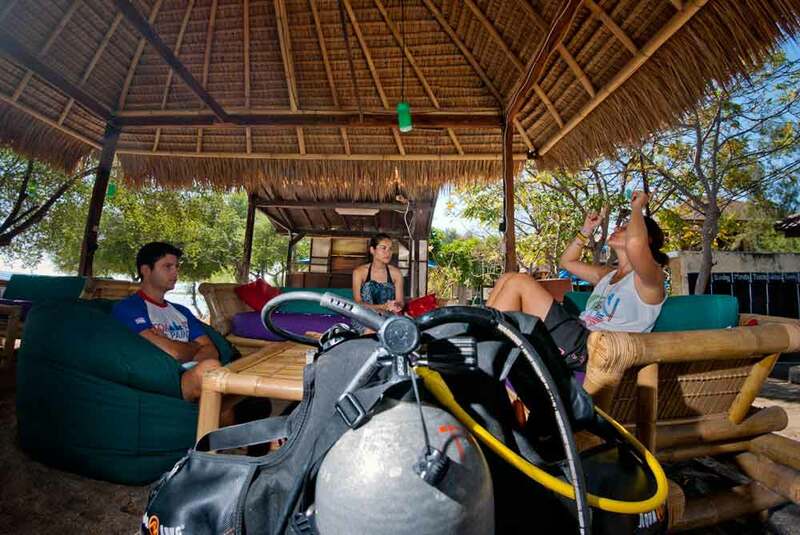 Luwala Dive is a PADI 5-Star dive center, and therefore able to offer all of the best PADI courses in a selection of languages. These range from your first breaths underwater as an adult or even a child, right up to becoming a professional PADI diving instructor by taking part in the monthly IDC courses. The most popular PADI diving courses taught at Lutwala Dive are the Open Water Diver and Advanced Open Water Diver courses. However, at any given time, there are always Divemaster courses going on, and Scuba Reviews are very popular too. Below is a comprehensive list of the courses and prices available at Lutwala Dive at the northern tip of Gili Trawangan. Most guests make their own way from the pier or their resort to Lutwala Dive, located at the north tip of Gili Trawangan. This can be done on foot, by bicycle or by horse-drawn 'Chimodo' cart. Guests who would like to be collected from the pier or any other beach or resort are welcome to contact us to arrange a transfer at a competitive rate. All Lutwala Dive diving services are subject to a 10% tax & service fee. 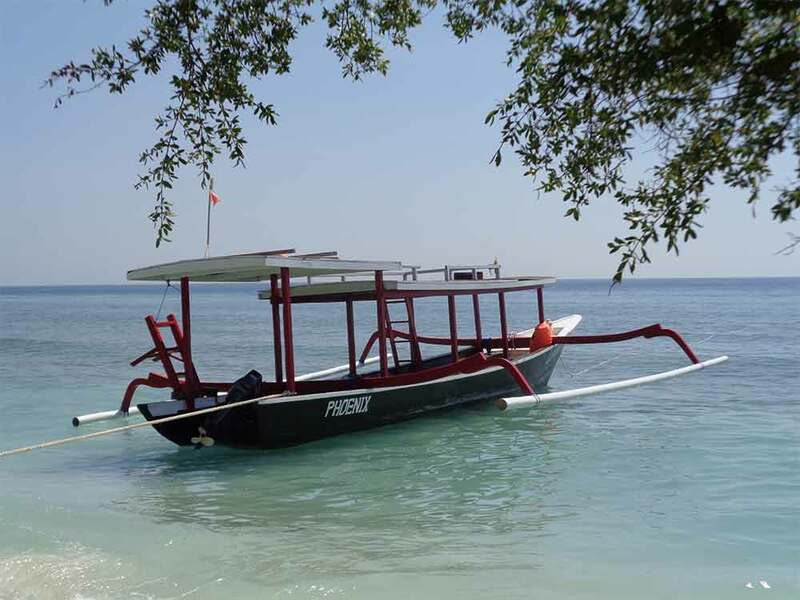 All divers in the Gili Islands are required to pay a one-off 'Gili Eco Tax' payment of 50,000 IDR (less than $4US). 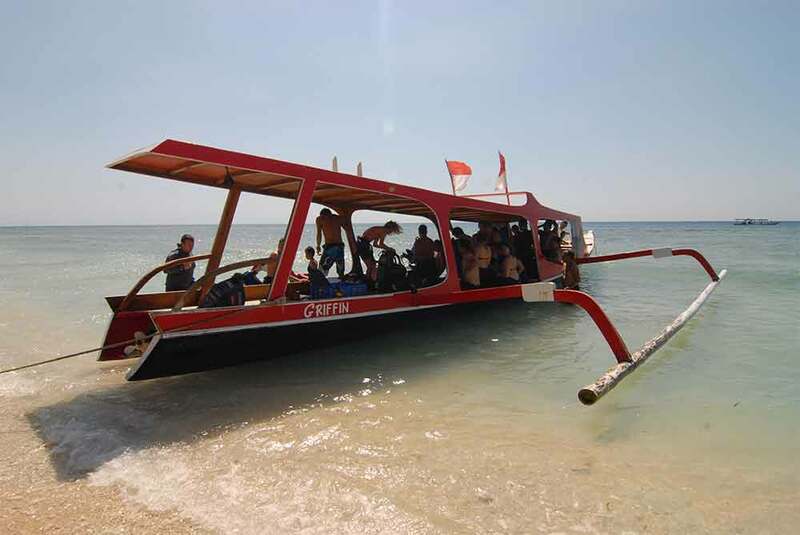 This fee is valid for 6 months and is used to care for the reefs, beaches and natural environment of the Gili Islands.